Aside from a house, or a car, major appliances are one of the largest purchases a family will make. And like any big purchase, it’s important to look after your investment. With appliance repairs more common than they used to be, you want to ensure that you’re doing your best to take care of your machines. You’d be amazed by how much a little maintenance keeps things humming along. At the end of the day, maintenance comes down to keeping your appliances clean. It really is that simple. A clean appliance performs closer to its manufacturer’s specifications is under less strain, and is less likely to suffer undue wear-and-tear. I’ve created these helpful tips, to keep your appliances in tip-top shape. Cleaning your oven is easier than you think. Commercially available cleansers do a great job, but if you’d prefer a more natural solution then baking soda, vinegar, and even lemon will make the messiest oven sparkling clean. Self-cleaning programs are a big help here. Just make sure you remove the racks and bulbs before you start, and let the oven cool for a few hours afterwards before you wipe down ash. A clean oven will improve performance and reduce the risk of fire. And that’s true of your cooktop as well. Glass cooktops should be regularly wiped down with soap and water to prevent stains and remove baked on food. While gas cooktops and electric coils should be carefully dissembled and cleaned piece by piece to remove food, grease and other particulates. Don’t use aluminum foil on your cooktop or in your oven. No matter what you’ve heard, aluminum foil can short out your circuitry, block your vents or damage the coating of your oven. Don’t do it. Cleaning your fridge is a big deal. Not really. There’s a whole day dedicated to it. It’s that important. Pull out the food, pull out the shelves, the drawers, all of it. Maintaining your fridge is a top to bottom job. 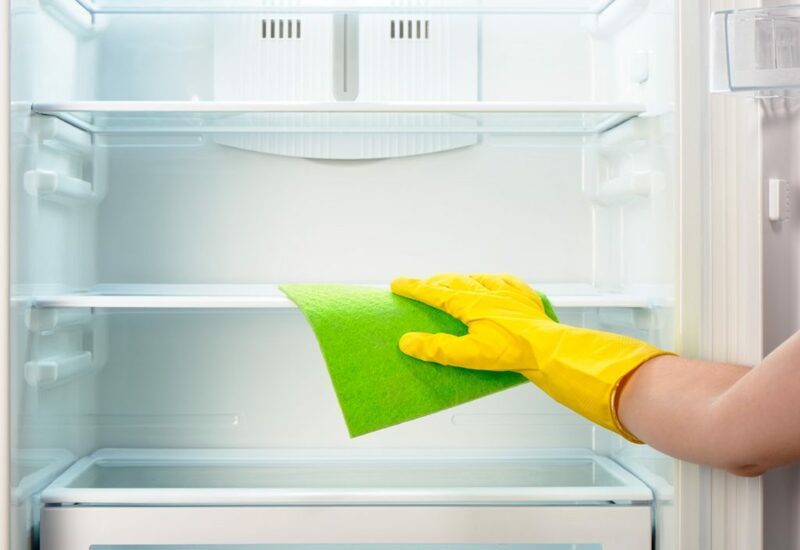 Removing spoiled food will keep your fridge stain and odour free. And wiping down any sticky residue inside and out will make sure the gaskets and drawers aren’t working harder than they need to be. Once you’ve wiped everything down, unplug the fridge and pop the kick plate off to expose the coil. A dusty, clogged coil is more likely to burn out so grab your vacuum and give them a good clean. Manually defrosting your freezer and/or fridge will ensure that proper performance and optimum cooling temperatures are maintained. Aim to do it twice a year, or whenever the ice build up reaches two inches deep. Burnt and baked on food isn’t just unsightly. That excess waste can catch fire or burn the interior plastic of the microwave. A small dish of water cut with vinegar or lemon microwaved on high to produce steam for a few minutes will do wonders. On the outside, be sure to wipe down any gaskets to prevent sticking, and carefully wipe down the control panels with a damp cloth or sponge. Keeping your dishwasher maintained is as easy as keeping the drum and filter clean. To sanitize the drum, run an empty hot water cycle with a cup of white vinegar on the upper rack. Afterwards, flush the drum on a hot water cycle with a few tablespoons of baking soda to scour build up, and eliminate stains. 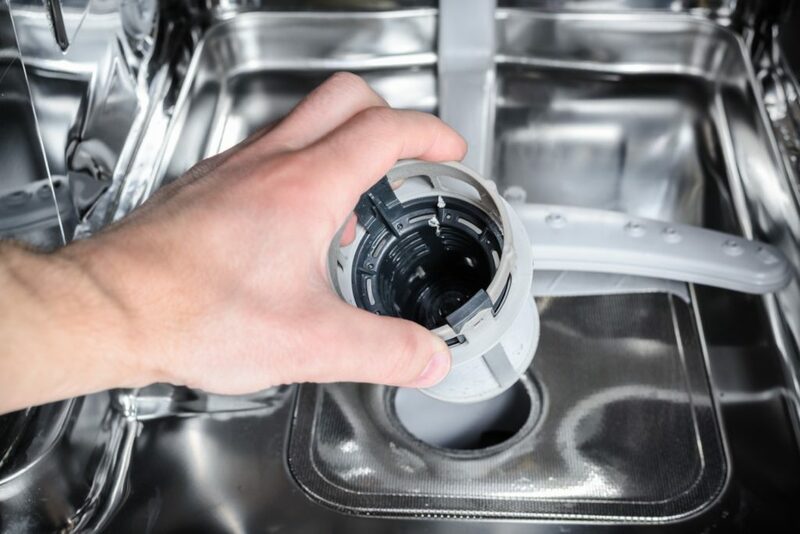 Most dishwashers now have a manual filter located next to the bottom spray arm. Manually unscrew the filter and remove any captured food or residue. Remove the screen and give it a scrub under the hot water tap to remove any grease or odour causing bacteria. Finally, scrub the spray arms, top and bottom using a toothpick if necessary, to unclog them. Keeping your filter’s clean is key for keeping both your washer and your dryer in good condition. On the washer, refer to your user’s manual to locate the filter. Unscrew and remove the filter from the machine, being careful to capture any water that drains, and scrub it with soap and warm water. Be sure to wipe down the cavity before replacing it. Once the filter’s clean, you can prevent odours by cleaning the drum with vinegar in a hot water cycle. With your dryer, make sure you clean the lint filter before each use. It’s also very important to have the machine cleaned by a service technician once a year. Lint will escape the trap and settle inside the body of your appliance. And that’s a huge fire hazard. A service technician will be able to open and vacuum your machine for a small fee. So grab your gloves, your bucket and your sponge. With a little TLC your appliances will perform trouble-free for years to come.